Ayurveda is an ancient science which was developed in India thousands of years ago. While modern medicine tends to focus on the management of illnesses, Ayurveda provides us with the knowledge of how to prevent illnesses and eliminate its root cause. The ancient Vedic literature clearly laid out instructions to maintain health as well as fight illnesses through therapies, massages, herbal medicines, diet control and yoga. Ayurveda is considered to be the world's oldest comprehensive health care system and is indigenous to India where it is widely practiced. This ancient art of healing asserts that science, philosophy and spirituality are all necessary aspects of healthy living. 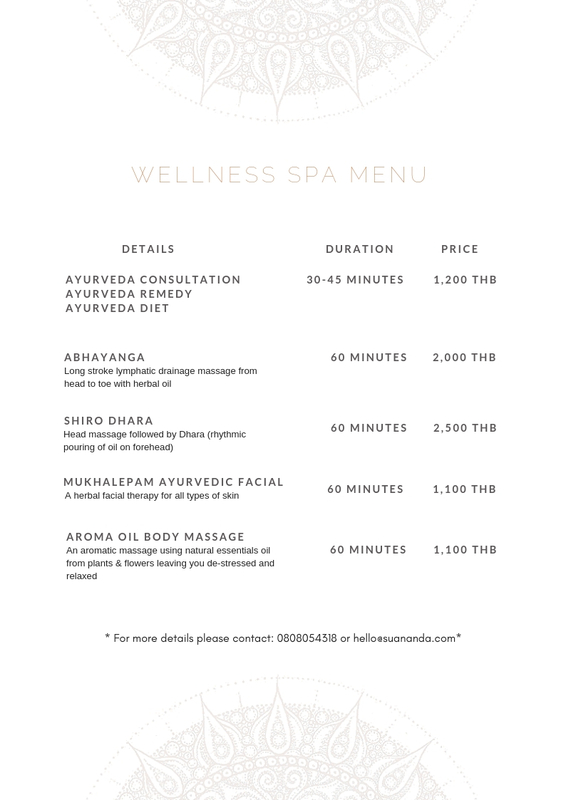 At Suananda, we believe in the ancient practice and holistic approach to health and well being. We provide massages using traditional herbal oils and offer Ayurvedic consultation. For more information, please fill in the form below or email us at hello@suananda.com.